Le Bois de Valmarie is a small yet wonderful 5 star campsite that’s set within 8 hectares of luscious green woodland on the side of a hill, just outside the popular town of Argeles-sur-Mer, on the south coast of France. Nestled between the sea and the mountains this fabulous resort is perfect for those looking to unwind and relax. Beautifully landscaped with a plethora of colourful flowers, trees and bushes you get a real sense of tranquility at Le Bois de Valmarie. The campsite is fairly small and as such it doesn’t have as many activities on offer as some of the larger campsites in the area. What the campsite lacks in activities it more than makes up for in charm and facilities. There’s a great restaurant, snack bar and take away and the local town has a great range of other eateries where you can enjoy some of the local food and produce. If you’re looking for a lovely relaxing campsite near to a great beach then this could be the campsite for you. Located just 200m away from Le Bois de Valerie is a stunning sandy beach. Fantastic for families of all ages, you’ll find plenty of space to relax and have fun in the sun. 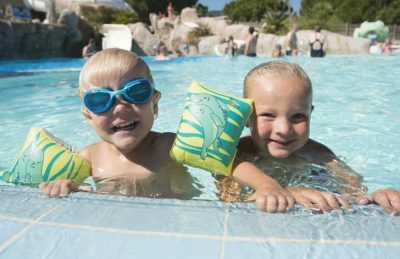 Back on-site at Le Bois de Valerie you’ll find an awesome swimming pool complex which was created with families in mind. Two heated swimming pools, 5 slides and some lovely sun terracing provide the perfect setting for a great family holiday. Le Bois de Valmarie campsite offers a comprehensive selection of activities and facilities on site and also nearby to ensure you have a fantastic family holiday. On-site activities at Le Bois de Valmarie campsite include table tennis, boules, wellness area, gym playground and cycle hire. Facilities available at Le Bois de Valmarie campsite include WIFI, restaurant, takeaway, bar, groceries, games room, animation team, washers and dryers. Accommodation at Le Bois de Valmarie campsite includes a range of 2 and 3 bedroom mobile homes that are available from Eurocamp.